Versatile, simple, freestanding. 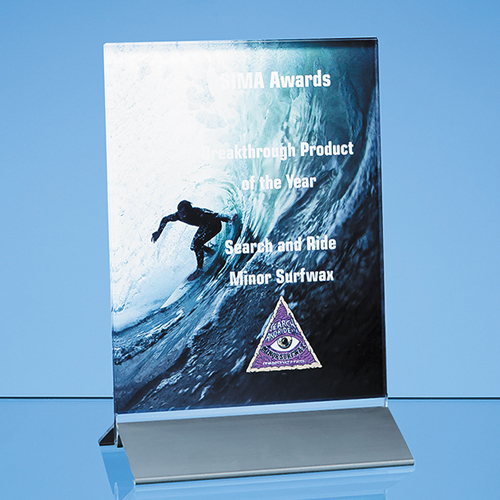 This rectangular clear glass award is 18cm long, 12.5cm high and 6mm deep, is presented on an aluminium base and has a wide variety of uses. It comes in three different sizes - 15cm x 12.5cm, 18cm x 12.5cm (shown) and 20cm x 15cm. It is ideal for 1st, 2nd and 3rd prizes, individual or team recognition, corporate awards or to commemorate special events or occasions. There is a generous engraving area with space for personalising with a company or organisation logo, crest or wording. It would look great whether displayed at home or at work. To complete the presentation why not order one of our deluxe, satin lined presentation boxes.